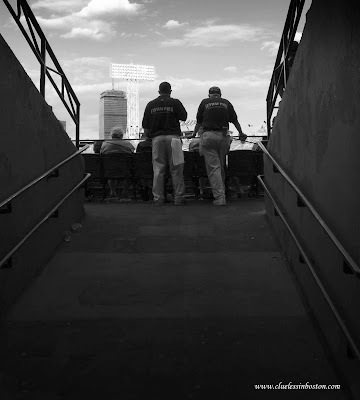 I caught these two security guys at Fenway standing alone and silhouetted against the sky. They were alone in the picture for just a few seconds, but I got the shot I wanted. Surprised the security didn't want you to delete the photo afterwards. Sally on her Sydney blog had talked about tourists being asked to delete photos. Great shot of the sky and the stadium!